�Muslims Invented Global Warming� to Destroy U.S.
Click a link above to go directly to the article. Return to this section by clicking To top at the bottom, left of the article. This year marks the centenary of ANZAC Day and the Australian International Islamic College was fortunate enough to be chosen to represent all the Brisbane students for the ANZAC Day student commemoration ceremony at ANZAC Square. It was a great honour to be a part of the commemoration ceremony on the 23rd April. Three of our college students had the opportunity to present a speech and recite poems. Omar Alshehri (pictured on TV above), a year 11 student gave a very heart-touching speech on the valuable contribution of those involved in the landing of Gallipoli. Omar expressed his gratitude on behalf of the younger generation for the significant sacrifices of the soldiers which brought about significant changes to Australia and the formation of nationhood. Later in the ceremony the poem entitled �Sir� by Damian Morgan was also beautifully recited by Omar Alshehri, followed by a recitation of a poem �The Inquisitive Mind of a Child� by Sumaiyah Gedik from year 10. The poem was about the significance of diggers and how a child lost his father. Rahim�s recitation of the poem had a huge emotional impact on the audience as it nearly brought many people to tears! Our college also held a special assembly on the 24th April commemorating the true spirit of ANZAC Day. Students not only participated in ANZAC Day commemoration, but also presented their poems and speeches at their special assembly. Mrs. Banwa, our principal addressed the assembly on the significance of the day and that the college has a proud history of participating in this event for many years. She congratulated our students who made excellent representation at this very significant event. Sule Kiza from year 10 and Emmanuel Gombu from year 7 also joined the participating group at our college function. Sule Kiza confidently recited the poem �ANZAC Day� by D.Hunter which was followed by Emmanuel Gombu from year 7 student, who creatively penned his own poem �True ANZAC Spirit�. To add more colour to our program, Janeth Deen, our guest of honour, spoke at length about the impact of the involvement of the Australian soldiers in WW1 and WW2. Our students remained silent as the last post was played, followed by one minute of sacred silence. The ceremony was concluded with a lovely PowerPoint presentation in remembrance of the ANZAC by Abdul-Aziz. 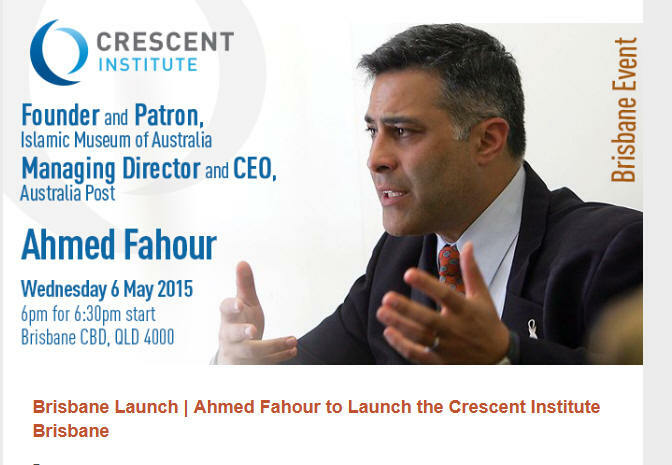 The newly-formed Brisbane Board are proud to announce the launch of Crescent Institute (Brisbane) with our first guest speaker, Mr Ahmed Fahour, the Founder and Patron of the Islamic Museum of Australia and Managing Director and CEO of Australia Post. The Crescent Institute vision is to be one of Australia's accessible pre-eminent business, networking and thought leadership groups. The Institute will build on an impressive and long-established network and on a range of thought provoking events and activities. 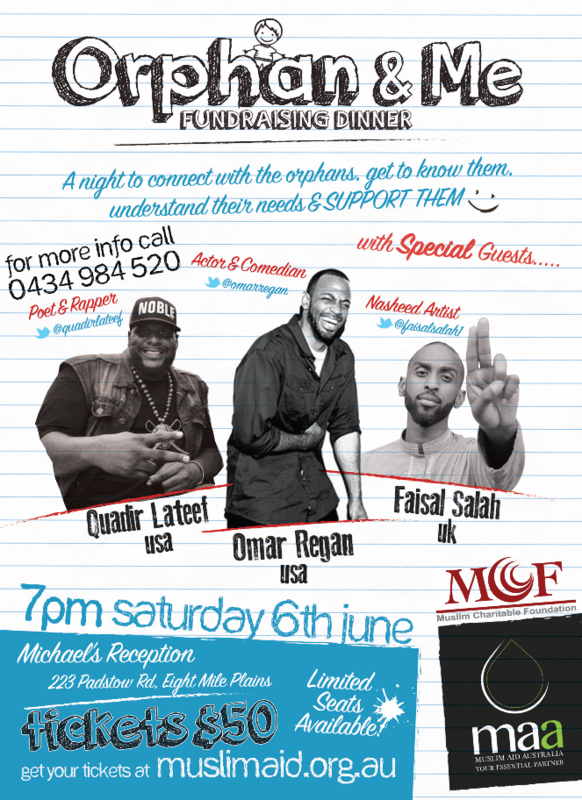 Please click here for details of this event (6 May at 6pm). Bookings are essential. Early bird tickets are priced at A$15 and regular tickets are A$25 each. 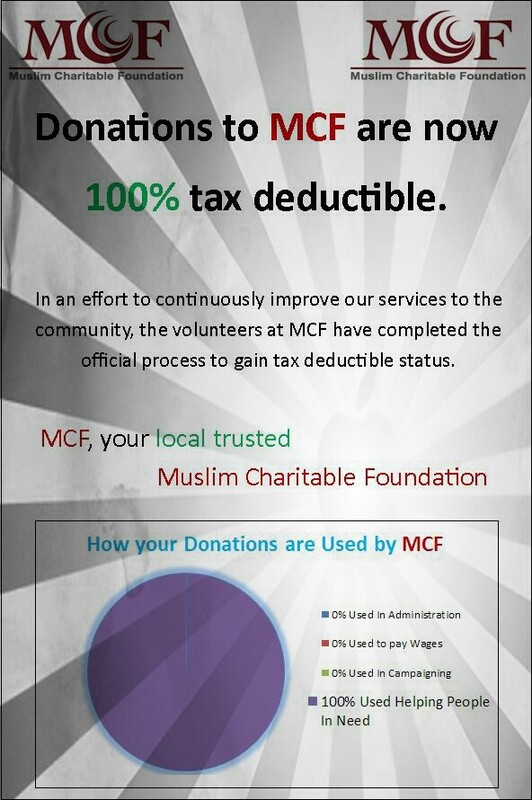 All funds go to supporting Crescent Institute�s non-profit activities. Please click here to book your place. 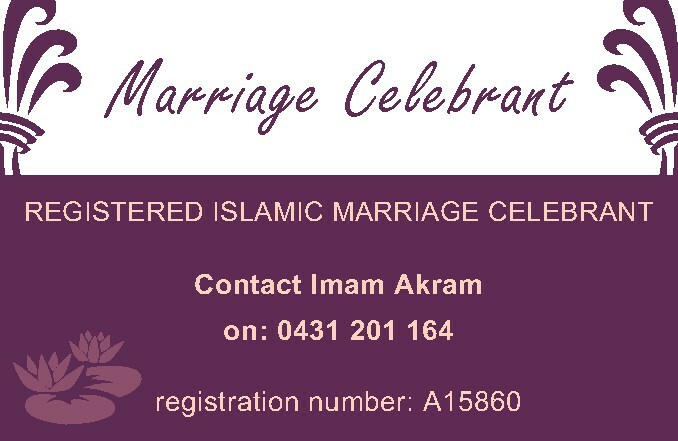 If you need any further information, please call 0402 026 786. 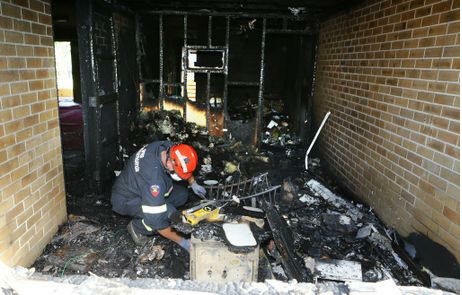 After the first arson attack on the Garden City Mosque on 24 January 2015, the second attempt to burn the Mosque was in the early morning of Friday, 17 April 2015. The neighbours called the emergency number at around 01:00am and firefighters brought the fire under control about 02:00pm. The police and other investigating teams along with the media representatives rushed immediately after. Muslim worshippers came to the Mosque for predawn (Fajr) prayers at about 05:00am were caught by surprise. By that time the Mosque area was declared crime zone. Having no choice we went to the University of Southern Queensland Prayer Room to perform Fajr prayers. Dr Md Shahiduzzaman and myself went back to the Mosque to see the latest and know the extent of damage due to the fire. We met an officer at the cul-de-sac (read side) entrance of the Mosque. He did not allow us to go insider the property but told us that the damage is much more than the first arson attack in January. Accompanied by him we were able to see some smoke markings on the entrance (door) of the office of the Imam and burned wood and air condition machine on the northern side of the office from outside. The area was full of smoke smell and marks of destructions. A $25,000 reward has been posted for information leading to the arrest and conviction of the person or persons responsible for the Garden City Mosque fire. Darling Downs police district officer Detective Inspector Dave Isherwood said it was hoped the monetary incentive would prompt someone with vital information to come forward to police. "We are appealing to the public for anyone with information in relation to the mosque fire to come forward and if that information leads to the identification and conviction of those responsible than they could be eligible for up to $25,000," Det. Insp. Isherwood said. 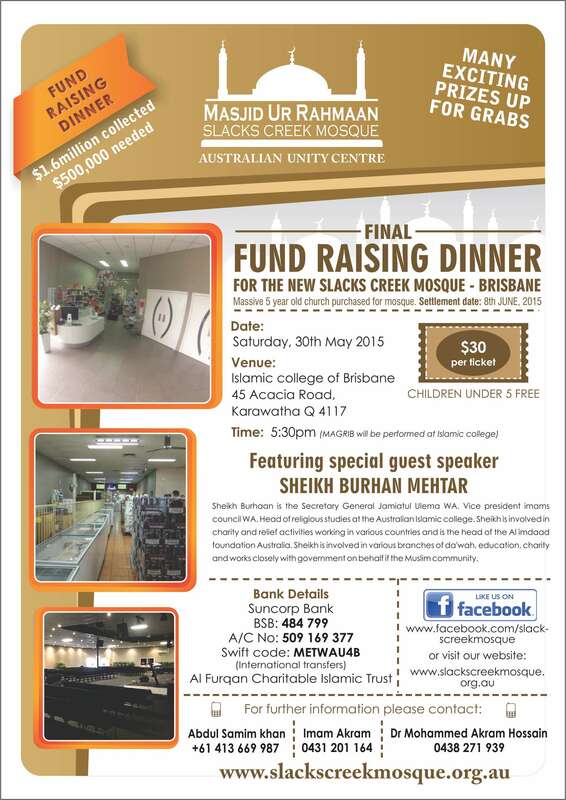 The Islamic Society of Toowoomba is issuing an appeal for donations to help rebuild the burnt building. The estimated cost for the rebuilding is $600,000 including new facilities for toilet and ablution for men and women. Although some money may be received from the insurer (depending on the assessment), the Society believes, "it may not even cover less than half of the rebuilding cost." 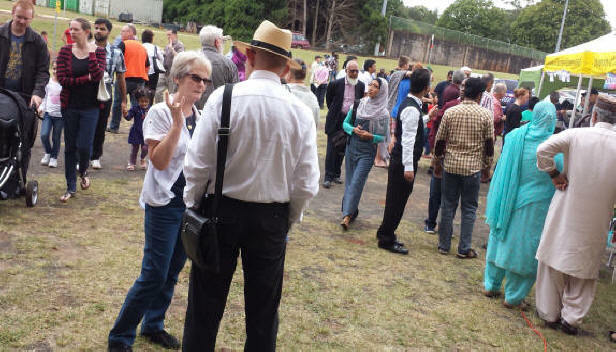 The fire at the Garden City Mosque and the resultant change of venue to USQ did not spoil the feeling of community at the International Food Festival for hundreds of visitors. Arabian Nights "restaurateur" Moyassar Al-Taie engaged the services of his whole family to run a stall at the festival providing authentic Iraqi cuisine. "It's the second time we have been at the food festival," he said. "It pleases me to see so many people here and to see the harmony between Muslims and non-Muslims. 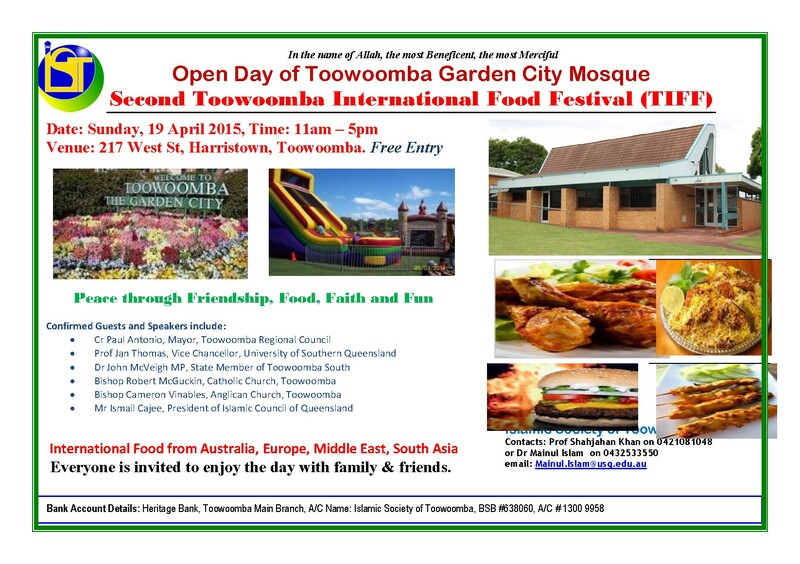 "What happened two days ago (mosque fire) doesn't represent what Toowoomba is. 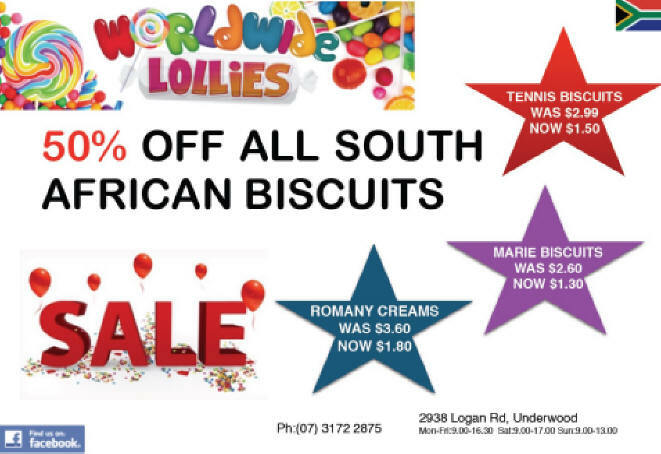 "The majority of Toowoomba people believe in multiculturalism." We have traditional Iraqi foods with two different types of rice and two different soups - one with beef and one with chicken," he said. "We had some Iraqi sweets but they sold out this morning." The USQ Clive Berghofer Recreation Centre was filled with the smells of foods from around the world during the festival, feeding the hungry masses. Non-Muslims got to observe Muslims at prayer and chat informally while a list of guest speakers from the wider community offered support and gave presentations, including Venerable Wu Ping of Pure Land Learning College, Catholic Bishop Robert McGuckin, Anglican Bishop Cameron Vinables, Mayor Paul Antonio and Jim Madden MP representing Premier Annastacia Palaszczuk. FORMER US attorney-general Robert F. Kennedy claimed his country�s response to intolerance was diversity, which itself was inspired by the �heritage of our religious freedom�. Despite this freedom of religion through the first and fourteenth amendments to its Constitution, there is of course intolerance in the US � but everyone knows they have legal protection for belief and practice. Australia�s Constitution gives protection to religious freedom and prohibits anyone from making laws which inhibit that. Again, like the US, this does not preclude intolerance or borderline religious discrimination. During waves of migration to Australia a minority of people have taken objection to some of the religious observance by those newly arriving communities � whether they have been Vietnamese Buddhists, Indian Hindus or Muslims from Islamic nations. 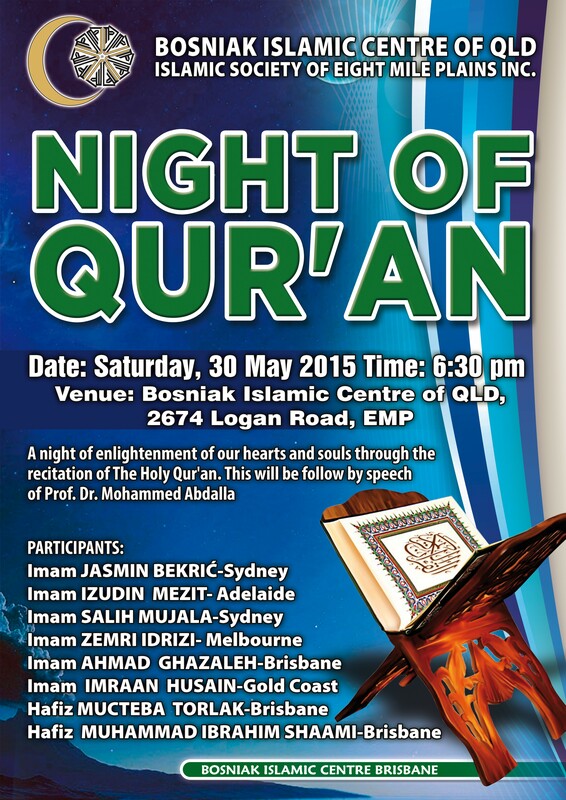 In the time since the terror attacks on US cities on September 11, 2001 there has been sporadic opposition to Muslims congregating in suburbs or building mosques � an often alarmist intolerance that�s been seen in Queensland as much as elsewhere. In recent weeks it has happened again, with community opposition to a proposal for a new mosque in Slacks Creek, in Logan City. A public meeting at the beginning of the month heard plenty of criticism from people living in the vicinity of the planned place of worship. This week those angry voices were echoed in the Logan City Council chambers where councillors demanded that if local Muslims didn�t �love the Australian way of life� they should go back to �where they come from�. This is simplistic and intolerant commentary which ignores the fact many of those who might worship at a Slacks Creek mosque are second generation community members born and educated in Australia. One councillor, Phil Pidgeon, attacked national politicians � saying they �need to be more vocal and say it�s not right to kill people�, while councillor Trevina Schwarz claimed the �lucky country was starting to go�. Other members of the Logan City Council made similar remarks, and the Logan Safe Communities group spokesman Chris Newman responded by praising the council for having a heart and soul. The reality is the national parliament has spoken as one in opposition to Islamist extremism, condemning terror attacks in Australia and overseas and passing new laws to tackle the influence and activities of ISIS militants. Also, Australia is as much a lucky country as it ever was � remaining the best place to live in the world. 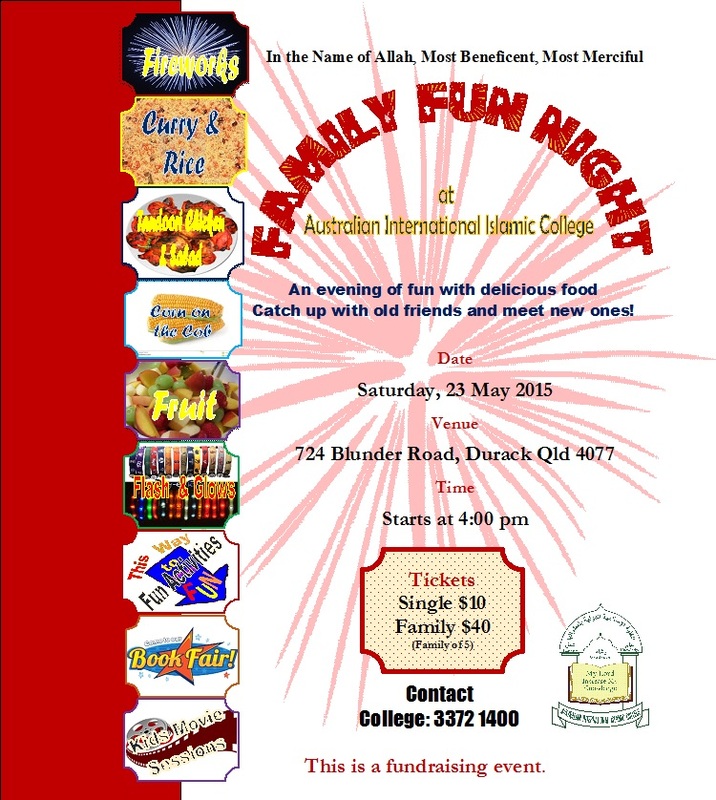 Much of the rich diversity we enjoy and share comes from Islamic Australians. 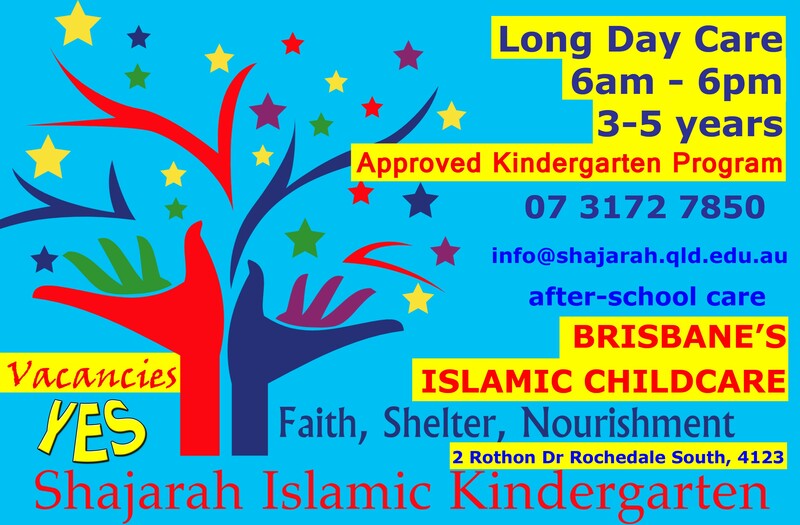 As to whether Logan City Council has a �heart and soul� will be judged by locals, but the short-sighted intolerance of councillors towards those wishing to add to the 35 Islamic mosques and prayer rooms in this state shows neither heart nor soul. While there is sometimes a reluctance from those in the Islamic community to condemn Islamist radical violence quickly or forcefully enough, this should not be read as an endorsement of the actions or ideology of groups like al-Qa�ida or ISIS. Tolerance is a two-way street and the elected representatives of Logan should understand they stand a better chance of gaining respect and co-operation from Islamic community leaders if they show respect and an appreciation of the beliefs and practices of Muslims. There�s nothing easier than stirring up base emotional reactions with demagoguery and alarmism. In fact, this is the very thing groups such as ISIS do by railing against the West. The strength of our democracy is that we respect other people�s rights and freedoms and do not descend to the level of those who would pit citizen against citizen in a bid to win political support or attract people to a cause. It is far better to work with the Islamic community, showing them they are welcome and that joining in our way of life is more rewarding and enriching than listening to preachers of hate and intolerance. The current Mosque at Arundel is at capacity every Juma and overflowing during the holiday seasons and Ramadan. 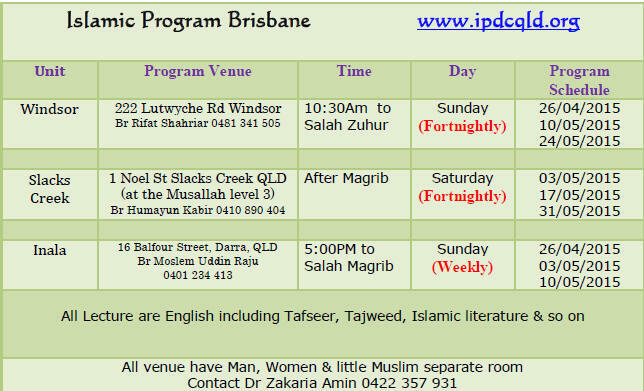 Another Masjid is needed on the Gold Coast. To this end, a site with existing buildings was selected on the most southern end of Gold Coast near the New South Wales border in Currumbin close to the Gold Coast airport, Southern Cross University, John Flynn and Tweed Heads hospitals. 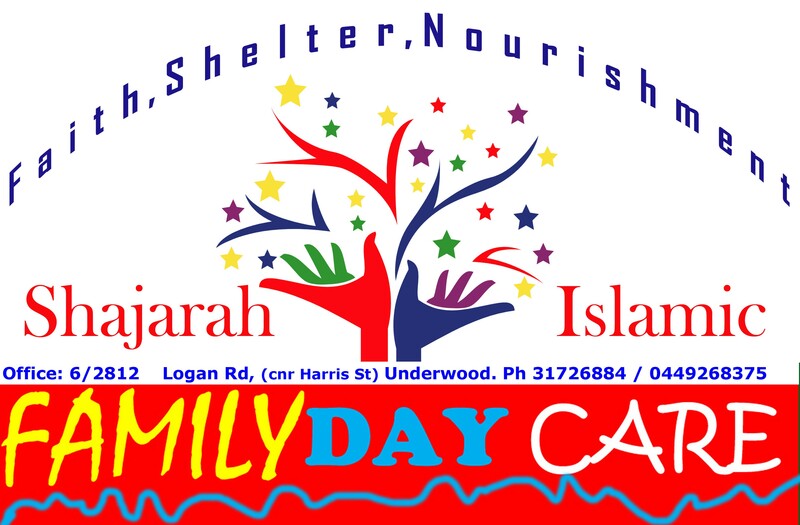 The residents of southern Gold Coast and northern NSW will be able to attend the Currumbin Masjid for their prayers as it can take up to an hour to travel to Arundel Masjid for Juma prayers. 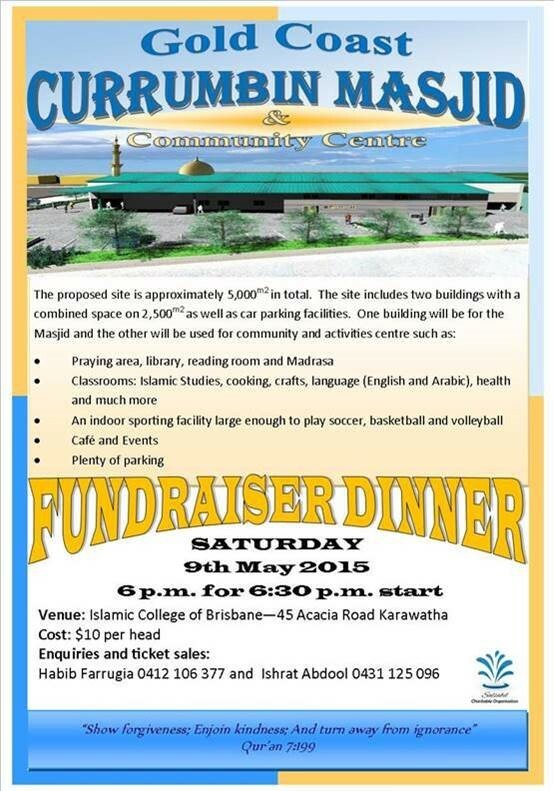 The first fundraising function for the Currumbin Masjid will be held at The Islamic College of Brisbane in Karawatha on Saturday 9 May, 2015, 6pm for 6.30pm start. TICKETS ARE ONLY $10 PER HEAD. 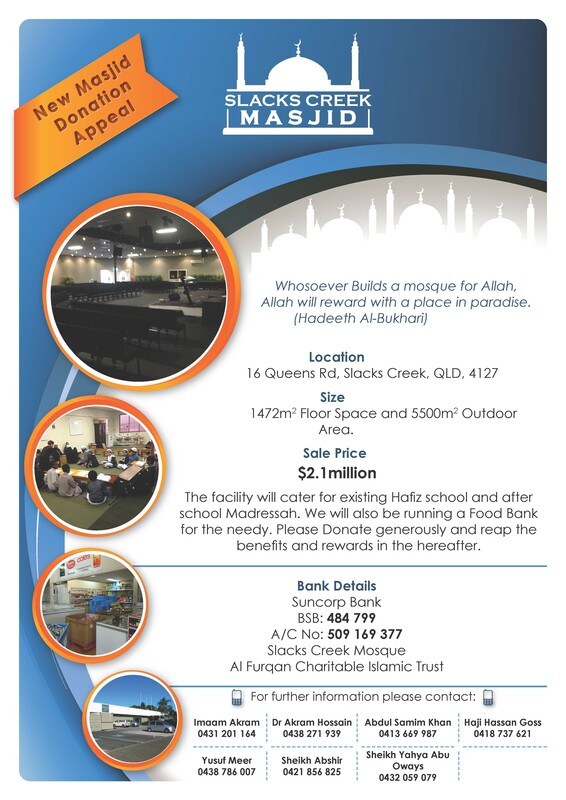 The Gold Coast Muslims seek support of Brisbane brothers and sisters to make their new Masjid in Currumbin a reality by assisting with donations. The tobacco industry attempted to reinterpret Islamic teaching and recruit Islamic scholars in a bid to undermine the prohibition on smoking in many Muslim countries, an investigation has shown. Evidence from archived industry documents from the 1970s to the late 1990s shows that tobacco companies were seriously concerned about Islamic teaching. In 1996, an internal document from British American Tobacco warned that, because of the spread of �extremist views� from fundamentalists in countries such as Afghanistan, the industry would have to �prepare to fight a hurricane�. BAT and other companies, which were losing sales in affluent countries where anti-smoking measures had been introduced, devised strategies to counter this perceived threat to sales in places such as Egypt, Indonesia and Bangladesh, which have large populations of young people who smoke. The industry was concerned that the World Health Organisation was encouraging the anti-smoking stance of Islamic leaders. A 1985 report from tobacco firm Philip Morris squarely blamed the WHO. �This ideological development has become a threat to our business because of the interference of the WHO � The WHO has not only joined forces with Moslem fundamentalists who view smoking as evil, but has gone yet further by encouraging religious leaders previously not active anti-smokers to take up the cause,� it said. It adds: �With Islam we might ask what other aspects of modern living are similarly open to extremist demands for prohibition under strict interpretation of sharia: motion pictures, television, and art depicting the human being? Use of electronic amplification by muezzin calling from a minaret? 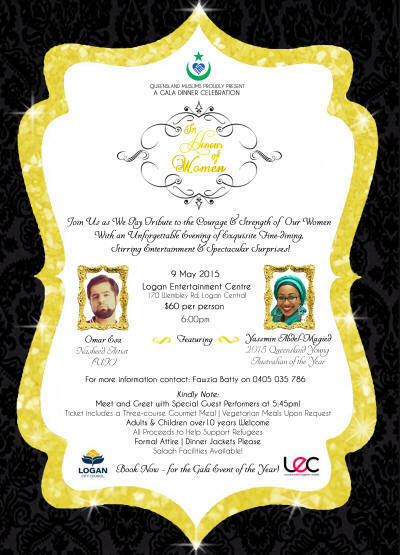 The education of women?� the document says. The earliest fatwa against tobacco was in 1602, but many scholars believed smoking cigarettes or taking tobacco in water pipes or other forms was harmless until evidence of the dangers to health began to emerge in the mid 20th century. Jurists pronounced that tobacco use was makrooh (discouraged). 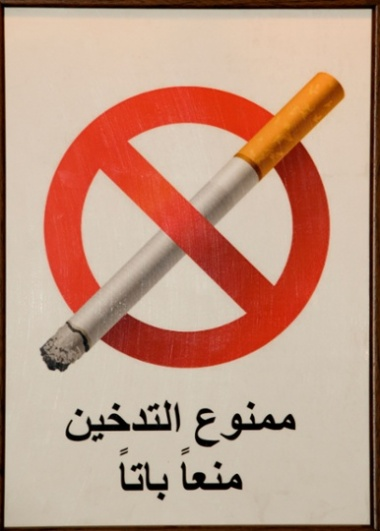 In many Islamic countries, a harder line was taken, with smoking prohibited on the grounds that the Qur�an does not permit self-harm or intoxication. The WHO negotiated the Framework Convention on Tobacco Control, starting in 1999, in response to what it describes as the �explosive increase in tobacco use�. The convention, which outlines strategies intended to reduce demand, was adopted in 2003. 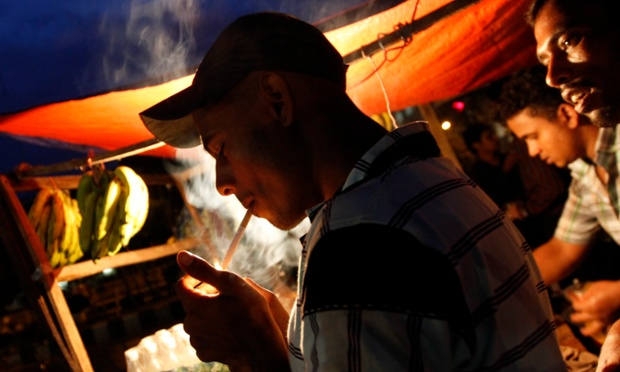 The tobacco industry attempted to re-interpret anti-smoking Islamic teachings. A 1996 BAT memo suggests identifying �a scholar/scholars, preferably at the Al Azhar University in Cairo, who we could then brief and enlist as our authoritative advisers/allies and occasionally spokespersons on the issue. Tobacco industry lawyers were also involved in this attempt at revision. 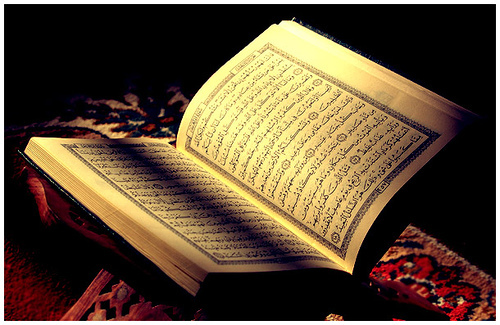 A presentation from 2000, prepared by the firm Shook, Hardy and Bacon, gave an overview of the background to Islam and smoking, with slides stating that there is no prohibition on smoking in the Qur�an � and that �making rules beyond what Allah has allowed is a sin in itself�. A document suggest Philip Morris wanted to try to recruit Islamic scholars at McGill University in Montreal, Canada. A representative of the Canadian Tobacco Manufacturers� Council �agreed to make exploratory contact�, it says. Petticrew and his team do not know whether they were successful. �We couldn�t find the papers,� he said. The tobacco industry is still heavily promoting smoking in countries such as Bangladesh and Egypt, which are predominantly Muslim and have high proportions of smokers. Its marketing is generally adapted to the �not overly devout�, says the study. The authors call for further research to find out how the industry had approached other faiths. �The launch of the Faith Against Tobacco national campaign by Tobacco Free Kids and faith leaders in the US, for example, brings together Christianity, Islam, Judaism and other faiths �to support proven solutions to reduce smoking�. Understanding efforts by the industry to undermine the efforts of other faith communities brings to light a broader strategy to marginalise tobacco control in diverse communities, and refocuses the problem on tobacco-related health harms,� says the paper. Philip Morris did not respond to the Guardian�s request for comment. In this episode of Halal in the Family, Aasif makes a new friend (The Daily Show's Jordan Klepper), but when he learns that Wally is Muslim, he becomes suspicious that his new friend is spying on his family. With Sakina Jaffrey (House of Cards) and Nicky Maindiratta. The first ever Sisters' House Online Auction is now up and running and will be open until 9:00pm Thursday 30th of April. More than 50 items are on sale ranging from crockery to kattaans. 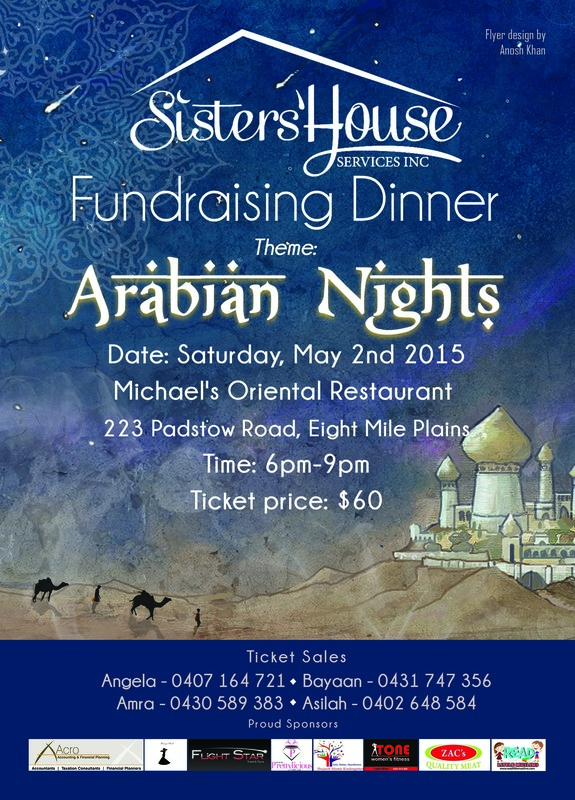 100% of proceeds from the auction will go towards the support services of the Sisters' House so that they can continue to help women and children in the community. When Lamisse Hamouda (pictured) heard that a Melbourne Islamic school had made headlines for banning female students from running, she knew it was her former school, Al-Taqwa College, at the centre of the controversy. 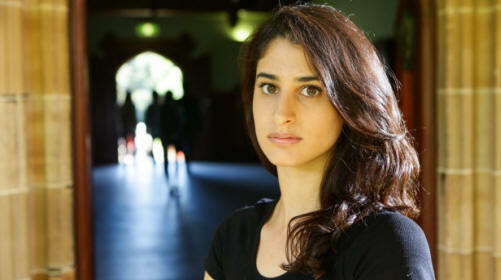 The 26-year-old Sydney youth worker also knew it was time to speak out about her own experience at Al-Taqwa. This is her story. A notification popped up on my phone saying my friend had posted a link to my Facebook page. I opened it, only to find my former principal's face sternly looking back at me. I knew what the article was about as soon as I read the headline [Girls at Islamic School banned from running], and I laughed. I laughed because I couldn't believe that Al-Taqwa College was still being run by an out-of-touch principal, Omar Hallak, who curbs the rights of female students to participate in sports by citing out-dated beliefs grounded in pseudo-science and patriarchy. US: Michele Bachmann claimed that Muslims invented global warming in hopes of weakening the American economy before a full-scale jihadi invasion. In an interview with Fox Business, the former congresswoman from Minnesota was asked her opinion on the recent report that 2014 was the warmest year on record, a fact most scientists believe is linked to human-induced climate change. �Muslims created the global warming hoax so we bankrupt ourselves switching to renewable energy,� Bachmann told a stunned Neil Cavuto. �Once our economy is completely destroyed, our military power will crumble, leaving us exposed to their jihadi invasion force. �Everyone knows you can�t run an army on solar panels. So the Muslim Brotherhood soldiers will meet minimal resistance when they arrive on our shores. New York and Washington will fall in days. Chicago and Los Angeles a few weeks later. �Within six months the invaders will establish an Islamic caliphate here in America. Headscarves will become mandatory. Churches will be burnt to the ground and mosques erected in their place. Christian virgins will be raped in the streets by roaming gangs of Yemeni thugs. �This is why the global warming lie is so dangerous. It�s clearly part of a larger plot to destroy the western world and establish a global Islamic empire. We need to expose these climate change scientists for the radical Muslims they are before it�s too late." Cavuto attempted to get Bachmann to roll back her comments, asking the former congresswoman if she had considered for a moment the possibility that climate scientists might be correct in their conclusions. Within six months the invaders will establish an Islamic caliphate here in America. Headscarves will become mandatory. Churches will be burnt to the ground and mosques erected in their place. Christian virgins will be raped in the streets by roaming gangs of Yemeni thugs. �Neil, my cousin�s husband�s best friend is a science teacher at Ramsey Middle School here in Minneapolis,� Bachmann explained, �and he says that the Earth has actually been getting colder for the past 50 years. Rajendra K. Pachauri has led the IPCC since 2002, overseeing the publication of several authoritative reports on the issue of climate change and its causes. He was born in India and is a practicing Hindu. Bachmann represented Minnesota�s 6th district from to January of this year. She decided not to stand for reelection in 2014 after a failed presidential campaign in 2012 nearly led to her defeat. It's always interesting to watch older generations dictate and decide what we, the young, should do. I believe the latest policy aimed at young people is headed straight for the bin marked "failure". An interesting and serious example of this is the solutions presented to combat the radicalisation of young people. Older generations mean well and are trying to find the answers to a growing problem. But when it comes to young people, it is hard to know what is going on in our minds. IS creates a sense of heroism within young men such as Jake Bilardi, and government policies won't counter that. When there is already so much resistance from young people to any government-designed idea, it is not going to work. 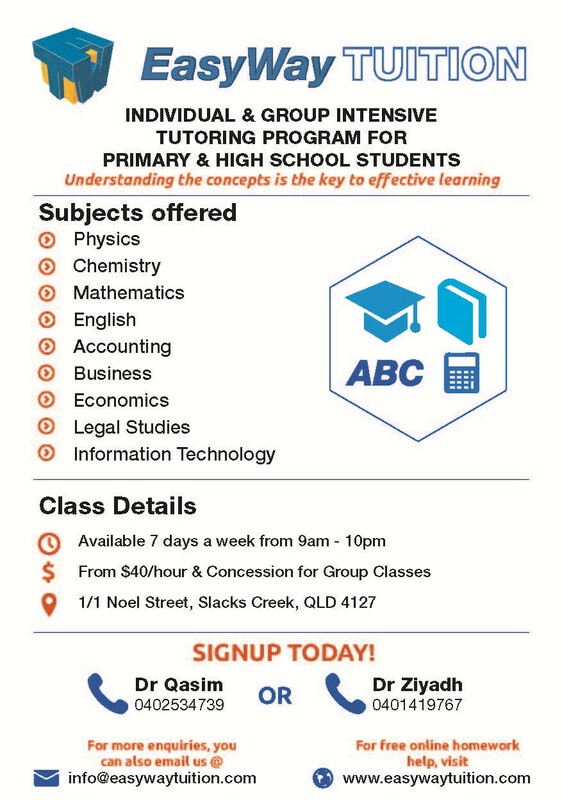 To do exactly that by introducing a Countering Violent Extremism (CVE) program, in which community organisations specialising in education or counselling can apply for extra funding and become service providers. The government identifies who is at risk of radicalisation and forces them towards these service providers. Essentially, this program is saying to at-risk young men: "we think you would do something wrong and we're here to stop it". It pushes them further down the path of radicalisation. My generation was born into the internet. It has become the avenue for radical preachers to target young men. And for young men to reach out to others, form friendships and concoct plans. The internet has become one of the most powerful tools for the dissemination of ideas and Islamic State has harnessed this power very effectively and persistently. In my experience, empowering young people with the ability to question what is presented to them, especially in the face of terrorism or extremist ideologies, is another preventative strategy. To some extent the solution is education. Schools, universities and vocational institutions provide an opportunity to gather young people, some radicalised and at risk, and deliver the same message to them all. Ideally education should transform the way people think and act. It must assume its central role in helping people to forge more just, peaceful, tolerant and inclusive societies. If our system taught this to all young people, we most definitely would not be having these conversations today. Although within my group at school we don't talk about radicalisation and Islam, perhaps it would help if we did. Making issues taboo and off-limits may well be worsening the situation.Instead, open, thorough conversations about the issues of the day empower young people to analyse what is presented to them. Rather than government policies and forced programs, community leaders should be utilised. With a greater chance of engaging young people, they are trustworthy and approachable figures. The positive thing about radicalisation is that it operates in networks. Connnecting with just one individual opens a pathway to others. The ripple effect that follows is powerful. During my work as youth ambassador for the Cancer Council, I noticed that connecting with just one young person from a certain group opened up communications with many others. Young people bind together, principally because we feel we are a generation misrepresented and not cared for. "I don't blame them for going to fight," one of my male friends revealed to me. Intrigued, I probed him further. "We face the never-ending pressures of school, the burdens our parents bestow upon us and our own sense of ambition to mean something in the world. For many young men, IS provides an escape and a sense of meaning. It takes them away from the problems we face in our lives and introduces an ideology that, in essence, is prevailing," he said. Many radicalised young people did not have strong religious views before joining IS. IS just encapsulated everything good to them. Within young men, IS creates a sense of heroism, advocating the misconception that in this war between the West and extremism, those who join IS will emerge as valiant heroes. They see that it takes a huge amount of bravery to venture alone to Syria, to fight for a group you hardly know, and to leave behind everyone you love. Some great force is needed to push young men to this consequence. Unfortunately, IS has discovered it and is using it. Perhaps this is what our politicians and decision makers need to realise. Treating the radicalisation of young people as a national security issue and introducing blanket policies is not the answer. Consulting young people and community leaders could well be. Rizina Yadav is a Year 10 student at Merewether High School. Snickers: You're Not You When You're Racist: Elliot Loney and Khaled Khalafalla! JMA enquired as to how the PM might feel about his faith being associated with the phrase as well as the term �sneaky� which was also used. 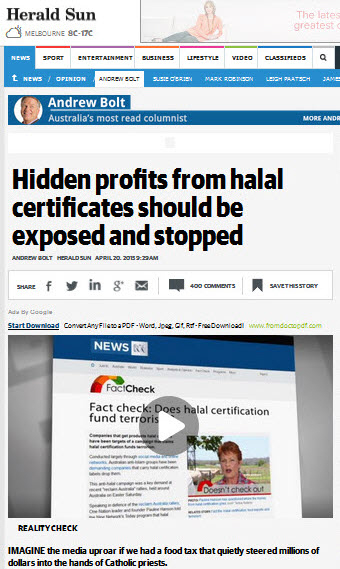 JMA also highlighted that the columnist singled out halal certification for scrutiny but did not state whether the federal government certification proposal should include kosher products or not. Finally, he inaccurately reported that the Grand Mufti of Australia was appointed by Muslims Australia. Mr Bolt agreed to correct the error and subsequently removed all online references including several negative imputations to the current Mufti of Australia. Upside down fridge(freezer below fridge) Dent and rust free User Manual included Immaculate condition and well looked after. Selling this well loved item as I am moving. We are looking to supply wholesale and retail Halal Quails to the Brisbane area. We need to ascertain the viability of the project and are asking business and private enquirers to email or text us if they would like to purchase the Halal Quails. We can also supply Quail eggs if this is something that people would like to consume. WASHINGTON�In an effort to streamline the process for qualifying travelers, officials from the Transportation Security Administration introduced a new precheck program Thursday that provides expedited interrogations for Muslim passengers. �Whenever I fly, there�s always a long wait in line before I get pulled aside for a security check and ushered into a back room where I�m grilled about my identity and background; but for just $120 and a short appointment, all of that waiting is removed, and I can skip straight to being questioned at length by law enforcement,� said Akron, OH resident Asma Soubra, who, along with other accepted applicants in the program, will be allowed to bypass other passengers and proceed immediately to a small, windowless interrogation room in the airport where officers will take turns attempting to pin extremist sympathies onto her. �I used to have to get to the airport so early to make sure I could get through the line and then all the intrusive searches of my belongings and the inquiries about my travel plans, religious values, and political beliefs. 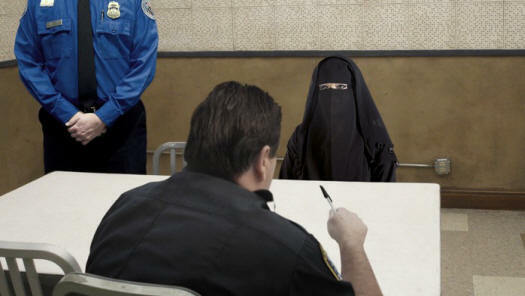 SA officials also confirmed they were planning to offer the expedited interrogations to non-Muslim travelers who simply look like they are from the Middle East. [CCN Editor] ....and who knows, many a truth has started of as a jest. SAUDI ARABIA: Sara Omar, grandma of US President Barack Obama, has emphasized the significance of the Prophet Muhammad exhibition in Makkah and said it reflects the moderate teachings of Islam that calls for tolerance and rejects violence. Sara has come to Makkah with her son Saeed Obama, uncle of President Obama and her grandson Mousa Obama to perform Umrah. She commended the Saudi government�s efforts to expand the two holy mosques. 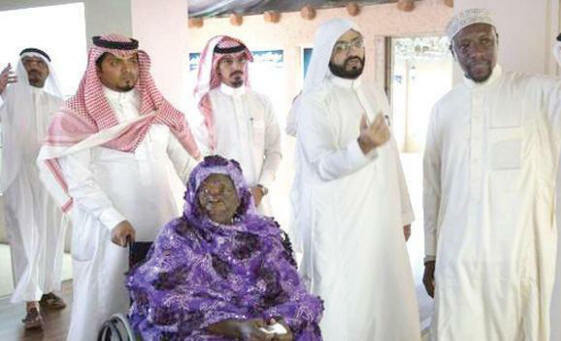 Obama�s grandma also expressed hope that the exhibition would visit other countries with the support of the Saudi government in order to remove the misunderstandings about the divine religion. New York judge says ads are protected speech and similar campaigns have run in other cities without inciting violence. 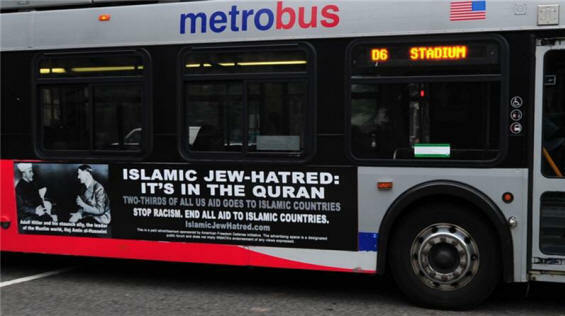 USA: United States federal judge has ordered New York's Metropolitan Transportation Authority (MTA) to display on its buses a controversial ad that refers to Muslims killing Jews, rejecting the argument that the ad could incite "terrorism" or imminent violence. In his ruling, published on Tuesday, US District Judge John Koeltl in Manhattan said the ad from the American Freedom Defense Initiative (AFDI), which had previously run in Chicago and San Francisco, was protected speech under the First Amendment of the US Constitution. Similar AFDI campaigns have also run elsewhere, including in Washington DC. The ad portrays a menacing man wearing a scarf around his head and face, includes a quotation "Killing Jews is Worship that draws us close to Allah" attributed to "Hamas MTV", and then states, "That's His Jihad. What's yours?" Koeltl said he was "sensitive" to security concerns, but noted that the MTA and Chairman Thomas Prendergast "underestimate the tolerant quality of New Yorkers and overestimate the potential impact of these fleeting advertisements. It strains credulity to believe that New Yorkers would be incited to violence by ads that did not incite residents of Chicago and San Francisco". MTA buses and subways are often forums for policy debates. The agency has accepted other ads from the AFDI, which is characterised as an anti-Muslim group by the Southern Poverty Law Center. MTA spokesman Adam Lisberg said the agency is disappointed in the ruling and is reviewing its options. The judge suspended the effect of his order for a month to leave time for appeals. 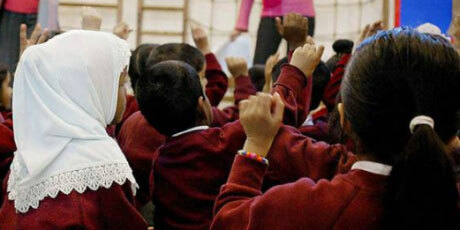 Is state Islamophobia coming to a UK classroom near you? We cannot allow our schools to become seeding ground for this latest wave of state Islamophobia, says Max Rosenberg. UK: The National Union of Teachers conference attracted front page headlines over Easter for its stand on Prevent, the government so-called �anti-extremism� strategy. Previously a voluntary scheme, Prevent has now become statutory under the Counter Terrorism Act (CTA). 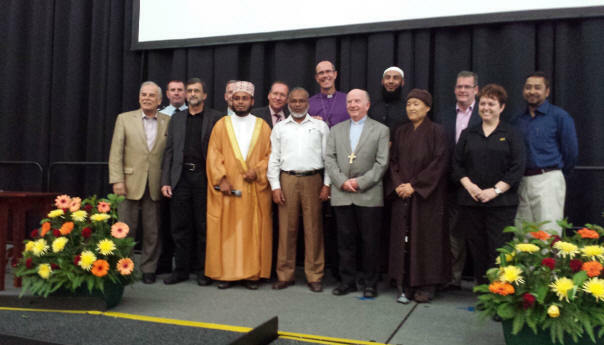 The union conference position represented a beacon of principle against state Islamophobia. Since January, we have seen a steep rise in anti-Muslim racism: a wave of demonising coverage followed the Charlie Hebdo murders; a political and media backlash was mounted against CAGE, the human rights organisation for Muslim prisoners; Theresa May announced new Tory manifesto pledges including the power to close Mosques and religious �supplementary� schools. May declared �game over� for �non-violent extremists� while Nigel Farage referred to a Muslim �fifth column� out to kill us. Meanwhile the election campaign is panning out to be the most racist in decades. Not surprising then that teachers� delegates gave example after example of Muslim students refusing to express their opinions for fear of being labelled extremist. NUT conference heard how whole classes shut down in silence at the mention of Charlie Hebdo and students would not admit they found the cartoons offensive in case they were reported. Prevent officers have told teachers that a student who goes on a demonstration against the bombing of Gaza should be treated as a suspect; even charitable work for Palestine has been challenged. This is the tip of a growing iceberg. 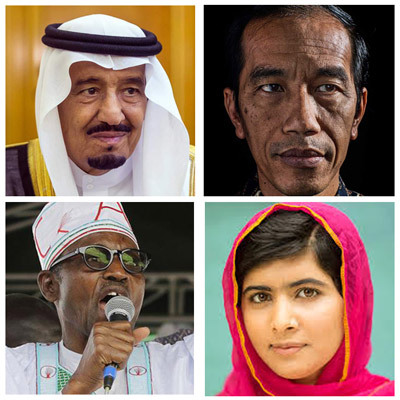 Celebrating their achievements, Time magazine has named several Muslim leaders and icons in its 2015 list of The 100 Most Influential People in the World on April 16. The annual list showcases five categories; Titans, Pioneers, Artists, Leaders and Icons. Muslim leaders like Nigerian President Muhammadu Buhari, Indonesian President Joko Widodo and King Salman bin Abdul Aziz Al Saud of Saudi Arabia were named by the Time. Iran�s foreign minister Mohammad Javad Zarif and the Iraqi Prime Minister Haider al-Abadi were also included in the list. Influential Muslim women like Nobel laureate Malala Yousafzai and Afghanistan's first lady, Rula Ghani, were also mentioned for their crucial lure in championing education and women's rights. UK: Discrimination against Muslim women in the workplace means they are much more likely to be unemployed than white Christian women - even when they have the same qualifications and language skills - research shows. British Muslim women are around 70 per cent more likely to be looking unsuccessfully for work, according to the University of Bristol�s Dr Nabil Khattab, who spoke at the British Sociological Association�s annual conference in Glasgow. The recent national Labour Force survey showed the unemployment rate among Muslim women was 18 per cent, compared with 9 per cent for Hindu women and 4 per cent for white Christian women. This has previously been attributed to Muslim women being less well educated and less fluent in English, but Dr Khattab says his data shows the discrepancy is also likely to be explained by employer discrimination. KUALA LUMPUR ― A local Muslim actress and model voiced indignation today over the forced removal of a church cross by a group of Muslims in Petaling Jaya, and extended an apology on their behalf to �my Christian sisters and brothers�. Wardina Safiyyah, who now resides in Australia, also expressed hope that the church in Taman Medan would not take down its cross. �I hope the cross stays there. ‪#‎letthecrossstay Please don't take it down,� the tudung-clad actress wrote on her Facebook page. �My heart goes out to my Christian brothers and sisters. I am so sorry that you are being bullied by my fellow Muslims,� she added. Wardina went on to point out that Muslims, since centuries ago during the time of Prophet Muhammad, have always lived harmoniously with the Christians. She said she even believes that Christians are the closest to Muslims. �I sincerely with all my heart love my Christian sisters and brothers,� she added. Explaining, Wardina said she understands how it feels to be a minority and to be bullied by others because of the faith she professes. She said in Australia, every time a non-Muslim voices support for Muslims, she feels grateful and thankful. Wardina urged Muslims to drop a flower at the doorstep of the church in a gesture of support after the Sunday incident. She said Muslims have no reason to fear the cross, as only vampires are afraid of such symbols. �Let the Christians worship freely. The Prophet pbuh says 'Kindness makes things beautiful, while violence renders them defective',� she said. During a protest on Sunday, a group of about 50 residents of Taman Medan gathered outside a church in their neighbourhood to demand that it remove the cross it had hung on its facade. The protesters, who were seen liaising with the church leaders through Umno branch leader Datuk Abdullah Abu Bakar, reportedly claimed that the cross, a religious symbol to Christians, was a challenge to the area's Malay-Muslim majority and could influence the young. Abdullah, who was later revealed to be the brother of Inspector-General of Police (IGP) Tan Sri Khalid Abu Bakar, has since insisted that he had not been leading the protest but was merely acting as mediator between the group and the church. UK: The readership of The Muslim News selected and nominated them, and a distinguished independent panel of Judges reviewed, deliberated and mused over the list. Over the next few weeks CCN will profile one of the illustrious men, women, children and projects deemed to be worthy of short-listing for a Muslim News Award for Excellence. Maaz Bin Saud is three times world kickboxing champion. At the age of 11 he won his first world title in Portugal in 2010 then second time in Spain in 2011 and last year he won the world title in two different categories third time in Montreal, Canada. The achievement crowned a string of victories for Maaz where he won number of tournaments including the British Open Championships, English National Championship, and the MAI Open Championship. Maaz continues his studies at his local school in Liverpool and attends Madrassah where he is doing hafiz Qur�an memorising � classes. 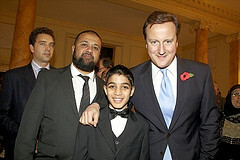 In 2010 Maaz was named Junior Sports Personality of the Year at the British Asian Sports Awards. Because of his achievements he was also invited to 10 Downing Street. Q: Dear Kareema, I love being in the water aqua-aerobics and swimming. Will these activities aid in burning calories and getting fitter? A: Of course. Both are great for fat burning and muscle toning. Why don�t you step it up a notch and try bodysurfing and stand-up paddle boarding. If you love being in the water, this will be great to incorporate into your workout routine and very challenging too. Muscles crave pressure to get stronger, so mix it up with your aqua and swimming and I guarantee you will love not only the workout, but the results as well. 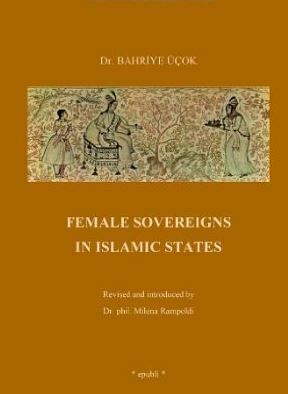 Dr. Milena Rampoldi, the translator of �Female Sovereigns in Islamic States� from Turkish to English, tells the tales of the great women in Islamic history. From Maldives to India, Rampoldi unravels the �political consciousness of Muslim women, who are called to actively participate in Islamic politics, to promote development, democracy and welfare in the contemporary Islamic world�. In this book, the translator presents a revised English translation of the work by the Turkish and Islamic feminist expert Bahriye ��ok (1919-1990) who in 1990, was murdered by a parcel bomb. With this new publication, the translator aims to allow the rediscovery of historical studies on Muslim women governing Islamic States, which in many cases are fundamental for Islamic feminism today. As Dr. phil. Milena Rampoldi writes in her foreword: �Those can help sources like us clearly understandable this issue from a historical and philosophical point of view. Like in the other two monotheistic religions, Judaism and Christianity in Islamic culture and religious history there is a predominating androcentric point of view, which excludes women from social and political life even more from, by interpreting and / or manipulating religious sources in a misogynist way, to prove dogmatically and a-historically decree and establish this exclusion, without permitting other interpretations, ran thus completely and / or negatively closing the hermeneutic circle �. The translator�s socio-political goal is to reactivate the political consciousness of Muslim women, who are called to Actively participate in Islamic politics, to promote development, democracy, and welfare in the contemporary Islamic world. KB says: The health benefits of fennel are said to include relief from a number of disorders. Fennel's essence is widely used around the world in mouth fresheners, and toothpastes. It originated in the Mediterranean and have long been used for culinary and medicinal reasons. Perhaps, a combination of fennel and carrots is just what the doctor ordered. Preheat oven to 200�F with rack in lowest position. Chop enough fennel fronds to measure 1 tablespoon and reserve. Discard stalks and remaining fronds. Slice bulbs 1/4 inch thick and toss with carrots, onion, garlic, 3 tablespoons oil, sugar, 1/2 teaspoon salt, and 1/4 teaspoon pepper. Spread in a pan and roast, stirring occasionally, until browned and tender, 25 to 30 minutes. Blend the vegetables in a blender with chicken stock until very smooth. Transfer to a medium saucepan and simmer until you reach the desired consistency. Meanwhile, finely grind fennel seeds in grinder and stir into remaining 2 tablespoons oil. 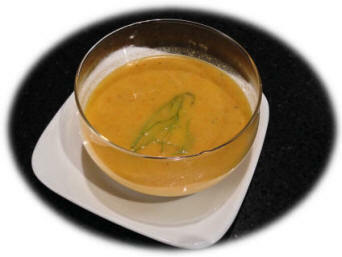 Serve soup drizzled with fennel oil and sprinkled with reserved fronds. Cook notes: �Soup can be made 1 day ahead and chilled. Father Flannery, a Catholic Priest, Reverend Billy Bob, a Baptist Preacher, and Imam Mula Nasruddin all served as chaplains to the students of Northern Michigan University in Marquette. They would get together two or three times a week for coffee and to talk shop. One day, someone made the comment that preaching to people isn't really all that hard - a real challenge would be to preach to a bear. One thing led to another, and they decided to do an experiment. They would all go out into the woods, find a bear, preach to it, and attempt to convert it. Seven days later, they all came together to discuss their experience. Reverend Billy Bob spoke next.. He was in a wheelchair, had one arm and both legs in casts, and had an IV drip. In his best fire-and-brimstone oratory, he claimed, 'WELL, brothers, you KNOW that we don't sprinkle! I went out and I FOUND me a bear. Then I began to read to my bear from God's HOLY WORD! But that bear wanted nothing to do with me. So I took HOLD of him and we began to wrestle. We wrestled down one hill, UP another and DOWN another until we came to a creek. So I quickly DUNKED him and BAPTIZED his hairy soul. And just like you said, he became as gentle as a lamb.. We spent the rest of the day praising Jesus Hallelujah! The priest and the reverend both looked down at Mula Nasruddin, who was lying in a hospital bed. He was in a body cast and traction with IVs and monitors running in and out of him. He was in really bad shape. Mula Nasruddin looked up and said: "Looking back on it, .......circumcision may not have been the best way to start." The Hypocrites - they think they are over-reaching Allah, but He will over-reach them: when they stand up to prayer, they stand without earnestness, to be seen of men, but little do they hold Allah in remembrance. Because consistency is the mother of mastery. For information on advertising in the CCN Business section and be included in our Directory Listing with a web link and a brochure, email ccn@crescentsofbrisbane.org. 1. All Islamic Event dates given above are tentative and subject to the sighting of the moon. 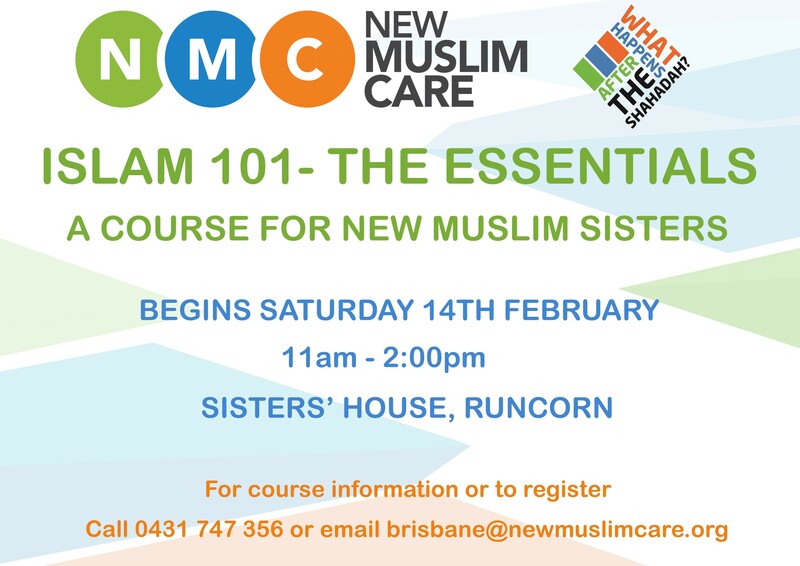 To help sisters on the northside of Brisbane to connect with their local sisters. 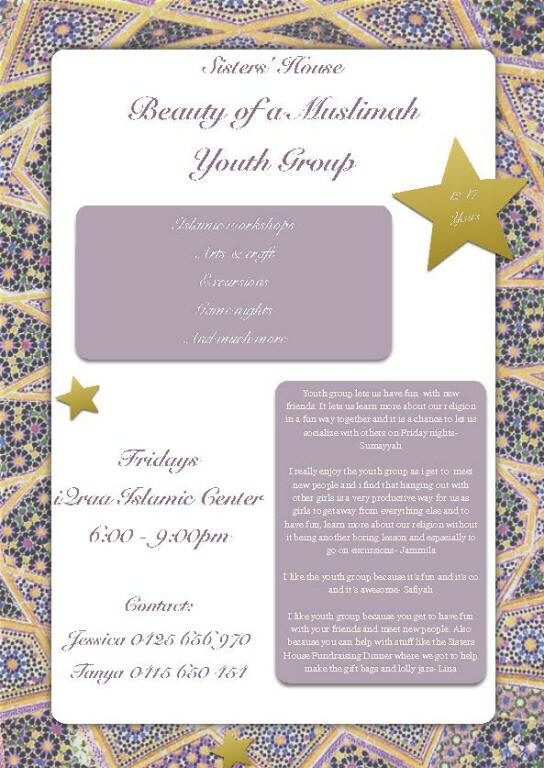 Islam, or for social events. The Tafseer gets recorded and uploaded on to our website end of each week, please visit our website to download these recordings at www.masjidtaqwa.org.au. 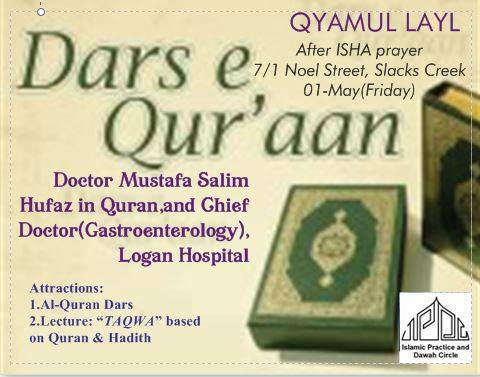 The Tuesday and Thursdays Dars Nizame program is in Urdu, these sessions too are recorded as well as webcasted live. For webcast details please contact us via our website �contact us� page. The recordings are sent via a download link, if you are interested please again contact us via our website �contact us� page. 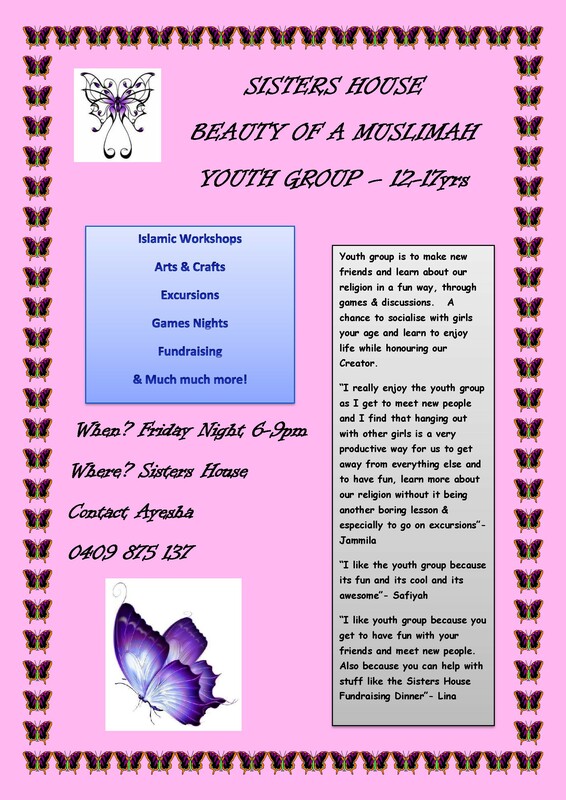 All Brothers & Sisters are welcome. 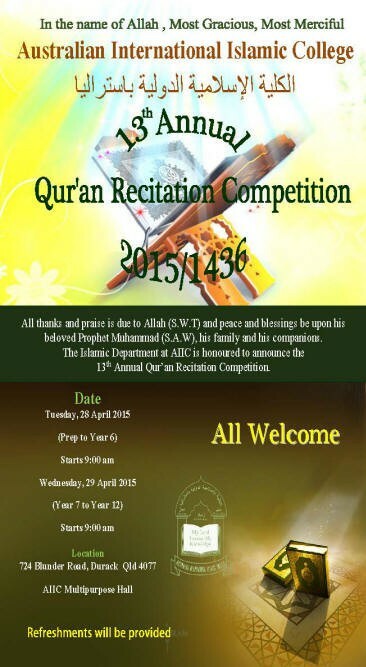 For further information please contact Moulana Noor 0432 712 546.